Over the past year we have been learning more about the financial situations across the pond in Europe. With international issues on the rise, investors are panicking trying to find a safest haven for their capital. This money has been bouncing from one investment to another trying to avoid the next major crash in stocks, bonds, currencies and commodities. It seems every 6 months there is a new headline news issue at hand forcing the smart money to withdraw from one investment class too another hoping to avoid the next meltdown. To make a long story short, I feel the market (stocks, bonds, currencies and commodities) are about to see another major shift that will either make you a boat load of money or you lose a lot of money if you are not positioned properly. Gold has just finished seeing a strong wave of selling this summer so it’s early to give any real forecast for what is next. That being said this long term chart may be telling us that gold’s rally could be nearing an end or a 12+ month pause could take place. If you have followed the market long enough then you realize that when everyone is in the same trade/position the market has a way of re-distributing the wealth to those who are savvy investors. Over the next 4-6 weeks there should be more price action which will allow me to get a better read for what is going to happen next. Silver has been showing strong signs of distribution selling. Meaning the big money is moving out of this industrial and highly speculative metal. 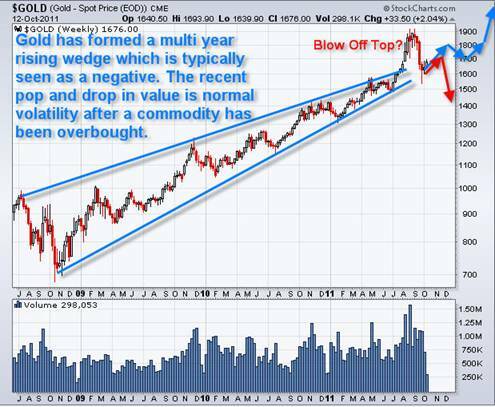 The interesting part here is that silver topped out much sooner than gold. 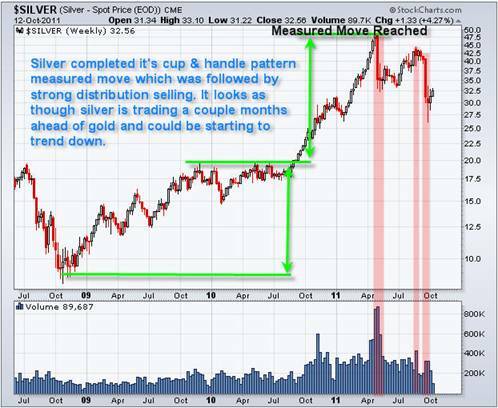 Many times in the past silver has topped and or bottomed before the rest of the market reverses direction. So it is important to keep an eye on silver as we go forward in time because it tends to lead the market 1-2 months in advance some times. Stocks in general are still looking ripe for another major bull market rally. But if we do not get some follow through in the coming 1-2 months then this almost 3 year bull market could be coming an end. In short, the market as a whole is trying to recover from a strong bout of selling over the past few months. In my opinion the market is ripe for another leg higher. The reason I see higher stock prices is because decisions are being made across the pond to deal with their issues. 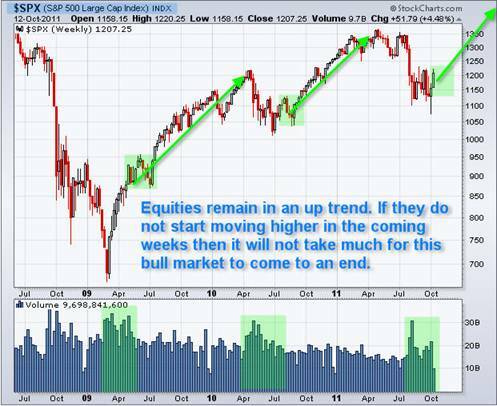 Looking back it is similar to what the United States did in late 2008 - early 2009 just before the market bottomed. Everyone right now seems to be saying Europe is screwed and that they are going about things in the wrong way, but if you think back that is exactly what took place in America not that long ago. And back then it was all over the news that the resolutions to fix the US would not work.... In the end, life continued, businesses continued to operate. Soon after decisions were made the stock market and commodities rallied and are still holding strong today.